Experience the flawless supremacy of this X299 GAMING M7 ACK, boasting some of the best features available to help enhance your overall gaming experience. A few examples of these are Killer GAMING LAN and WIFI, gaming device ports and Game Boost. 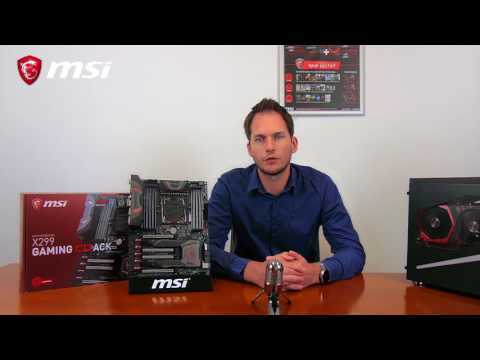 Plus, this MSI X299 is protected and reinforced through Steel Armor and M.2 Shield FROZR. These are just a few among many impressive features, get the most from your motherboard with the X299 GAMING M7 ACK from MSI. MSI motherboards let you manage speeds and temperatures for all your system and CPU fans, giving you full control to set up a cool and silent system. The fan headers are conveniently placed with the most popular CPU coolers in mind. Designed to support the most popular All-In-One and custom water cooling solutions on the market. A dedicated water pump PIN header supports up to 2 amp, giving you full control of the water pump speed. A clearly marked ‘keep-out-zone’ allows for easy and safe installation and a perfect fit. Next generation SSDs demand a next generation connector. U.2 delivers just that with performance up to 32 Gb/s per device. The U.2 connector on this MSI motherboard also features Steel Armor for enhanced protection. This new technological marvel brings game-changing performance to memory and storage devices. Allow Optane caching to boost your storage devices for an even faster system! Killer DoubleShot Pro allows the Killer™ Ethernet connectors and the Killer™ Wi-Fi adapter to work together for the ultimate high speed attack. The Killer Network Manager decides which apps runs on which connection for gaming traffic optimization. This will give you the max throughput as high as 1.867 Gbps. The built-in dedicated headphone amplifier rewards audiophiles with headphones up to 600Ω impedance by delivering studio-grade sound quality from your gaming PC. Audio Boost 4 automatically detects the optimal impedance for your headphones and adjusts the output for the best sound quality. Nahimic Sound Technology has been famed for its quality and precision in projects undertaken by the Military and the Aeronautics Industry. Their experience in reflecting surround sound at the most immersive level allows you as a gamer to experience the next level in sound and gameplay. Unique features, including a sound tracker which visually shows where the enemies are making noise in game, truly allow you to get the upper hand on the battlefield. The technical enhancements of DDR4 Boost allow for more stability at higher memory speeds compared to other brands. Enjoy the additional boost in operational performance or when working with large video and photography files. Ready for next generation cases and perfect to use with the latest smartphones, the onboard front side USB connector now offers ultra-high speed through USB 3.1 gen 1 Type-A and USB 3.1 Gen 2 Type-C (up to 10 Gb/s). When enabled, X-Boost optimizes your devices for even better transfer speeds and can provide up to 30% increase in USB performance, saving a lot of time when transferring data. This handy tool is very easy to use and automatically detects and optimizes the USB devices connected to your system. MSI have made sure you can enjoy your system endlessly. MSI motherboards feature Double ESD protection with double layer grounding around the motherboard mounting holes, preventing Electrostatic discharge (ESD) surges from damaging the motherboard. 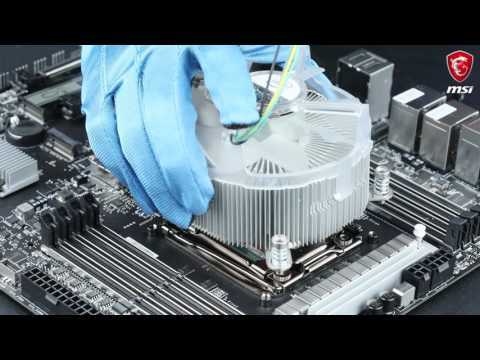 MSI uses Military Class 6 components, which is the latest evolution of the industries’ highest quality standard. These high quality components are shielded by the best protection to make sure your system runs smoothly under the most extreme conditions. When you just want to get back to work, EZ-mode presents you with basic BIOS settings and functions for some quick adjustments. If you feel like spending more time fine-tuning options to boost your system’s performance, the Advanced mode is the way to go. Can't find a specific BIOS setting? Don’t worry, a permanent search option in the top right corner can be used to find what you need. Want quick access to important settings? My Favorites gives easy access to selected Favorite settings, supporting up to 5 groups of Favorites. CLEAR CMOS The ClearCMOS button helps to restore the BIOS default settings which helps in 99% of the cases to successfully boot again. ClearCMOS will not restore the original BIOS code (will not revert back to the original bios version). Easy BIOS recovery with BIOS Flashback+ Run into trouble when updating your BIOS? Simply flash the old BIOS version back and continue gaming within minutes with BIOS Flashback+. BIOS Flashback+ even works without a CPU, memory or graphics card installed! DUAL BIOS Still aren’t able to successfully boot? Having 2 physical BIOS chips allows to have a plan B. Simply move the onboard switch to select the secondary stock BIOS and try booting from there. The second BIOS chip contains the factory default BIOS. User-friendly, easy-to-use application. Launch your favorite game with a single button.